So I can’t stop writing. Seriously, thank you all for being interested in what I have to say! 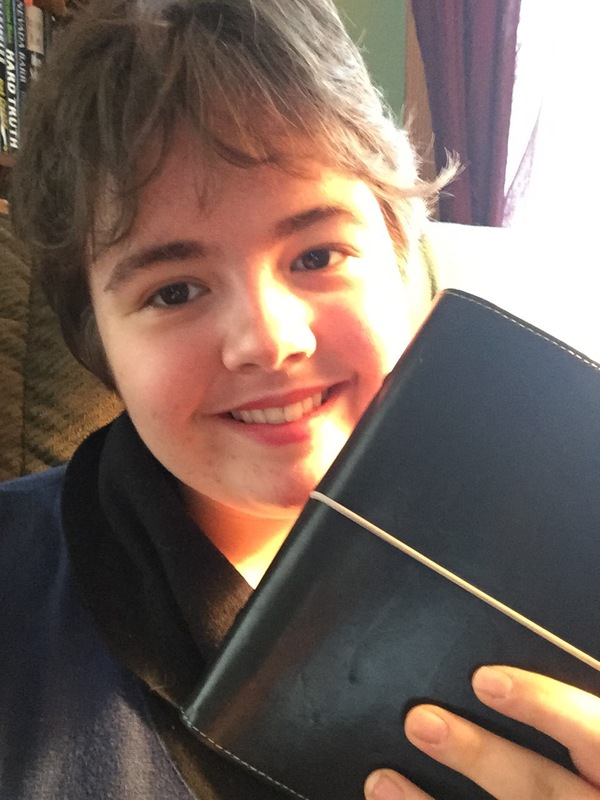 Thank you to those who voted in the poll–the results were a tie (at least so far) between how my Filofax has helped with my anxiety, and my depression turnaround, and as I’m upgrading to a new Filofax system soon I really wanted to write this one so that I can chronicle the current setup. If you’re interested there’s also an accompanying video, which is my first venture into Youtubing. I’m excited because this is my first post that will have pictures. And they’re pictures of one of my favorite things, the nerd that I am, my Filofax! 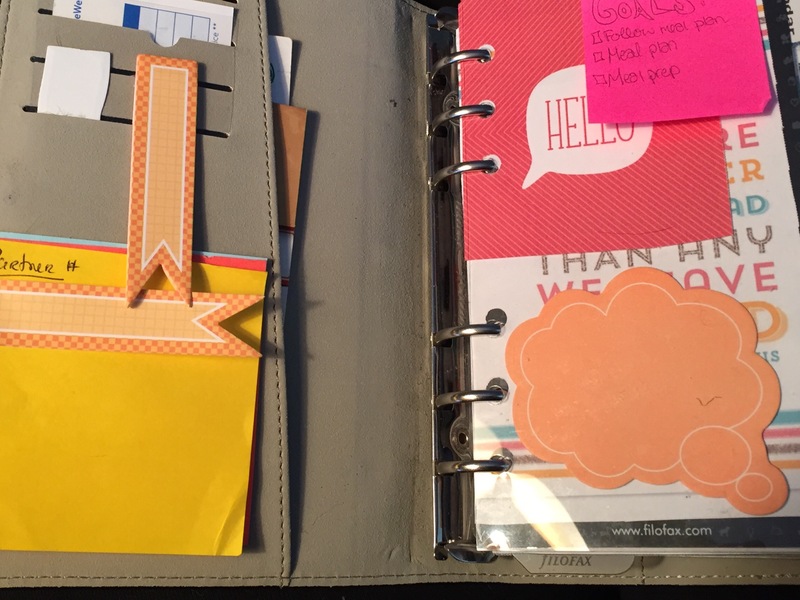 I started researching journals, and planners, and I came across the amazing Filofax community! Soon I was sucked into the videos, and the decorations, and the different ways of customizing your pages, and your setup, and I just had to get one. I ordered my black Domino that night, rush order (yes–next day delivery) because I had this feeling that it could help me for that weekend, and she’s been with me ever since! This is what you see!! 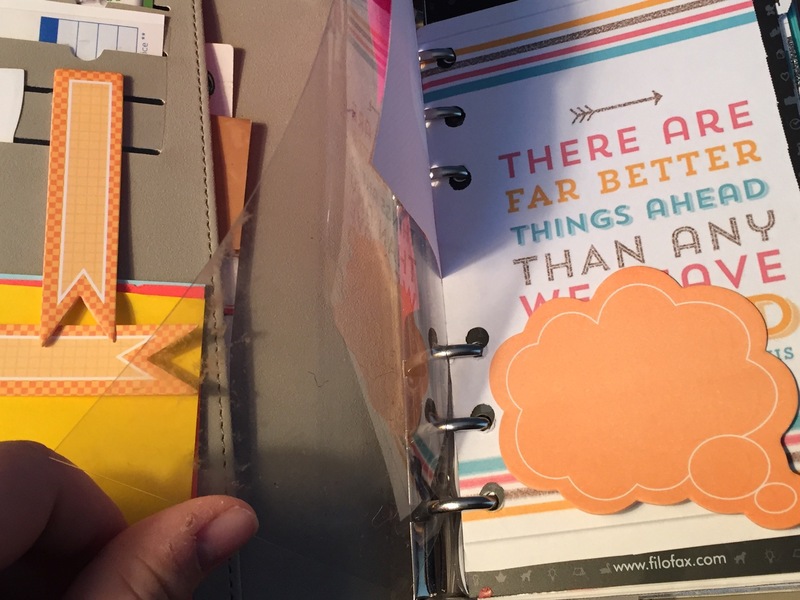 I have my dashboard, which has the occasional post it on it with reminders, but is more to protect the pages, sticky notes and quotes behind it. Silly as it may seem, opening my Filofax up to a big ol’ bright pink “Hello” makes me smile, so I keep it. On the back of the cover is five card holders, which I use for appointment cards and to hold sticky notes, in the pocket behind I have some labels right now– it’s super handy. Oh and just a close up of one of my favorite quotes. I don’t remember where I got these printables but If someone knows please tell me! 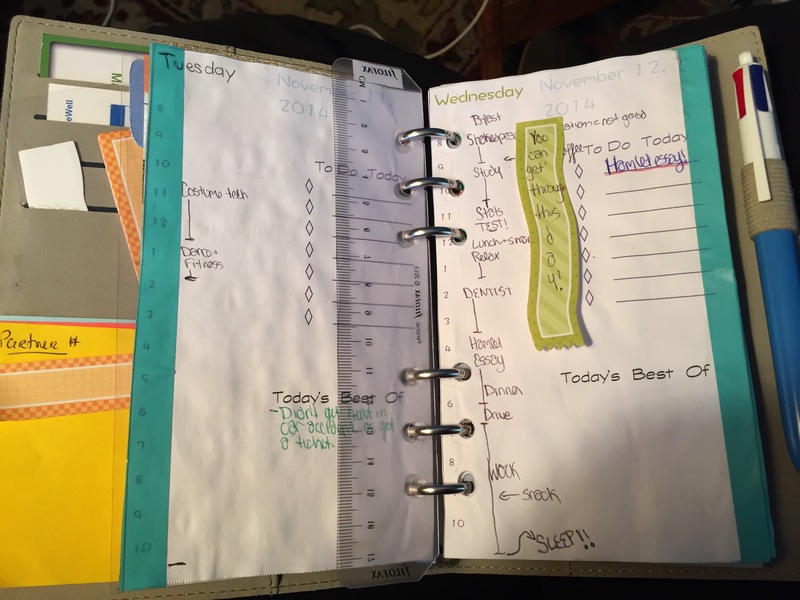 Comes the meat of the planner–my week on two pages. This is one section that really helps my anxiety. 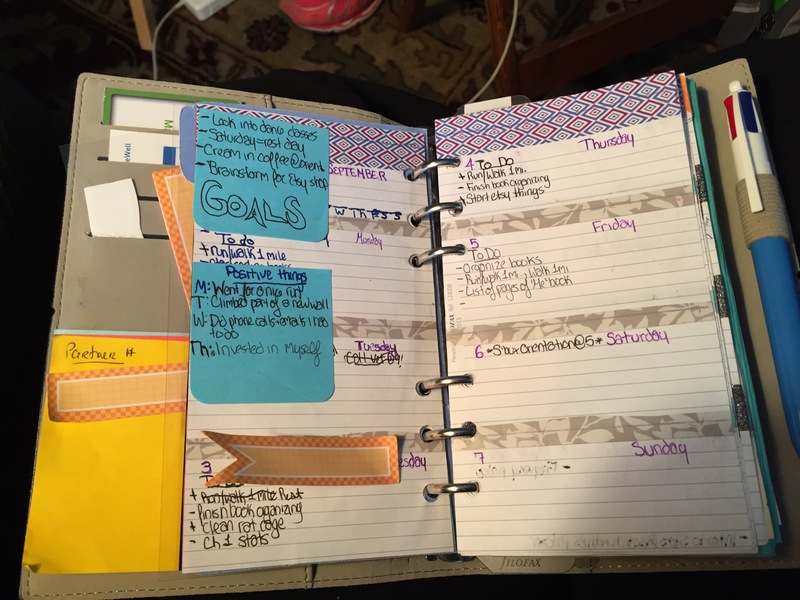 I use it to make to-do lists for every day, and I make all the lists on the Sunday before the week starts, using my syllabi and notes I make as needed about appointments. This way, I know what I have to get done, and how I’m going to spread up the work so that I have some free time but everything gets done. 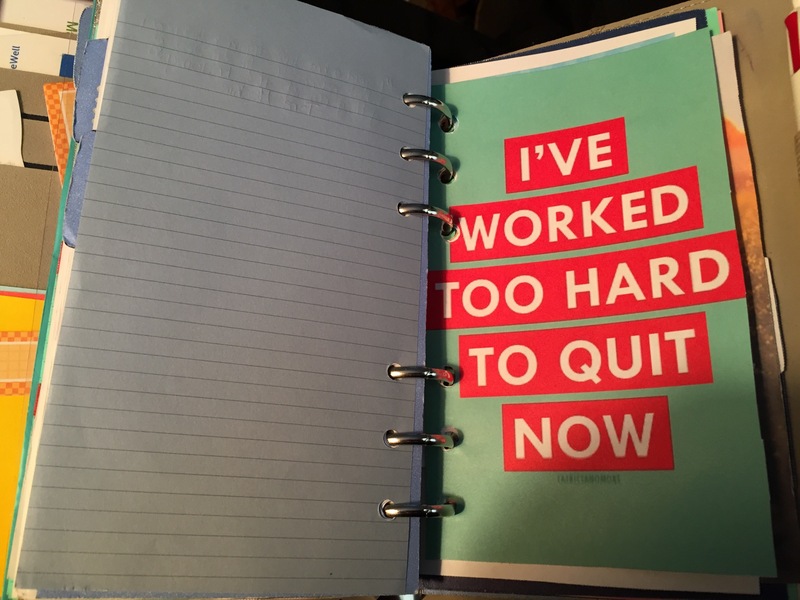 After I finish the to do lists, if there’s any doubt about how I’ll get through a day I used the calendar on my phone and block out every single minute, starting with the time-sensitive things, like appointments and classes, and then fitting in the rest of what I have to do. If it doesn’t work out, I rework the spread of the to do lists. 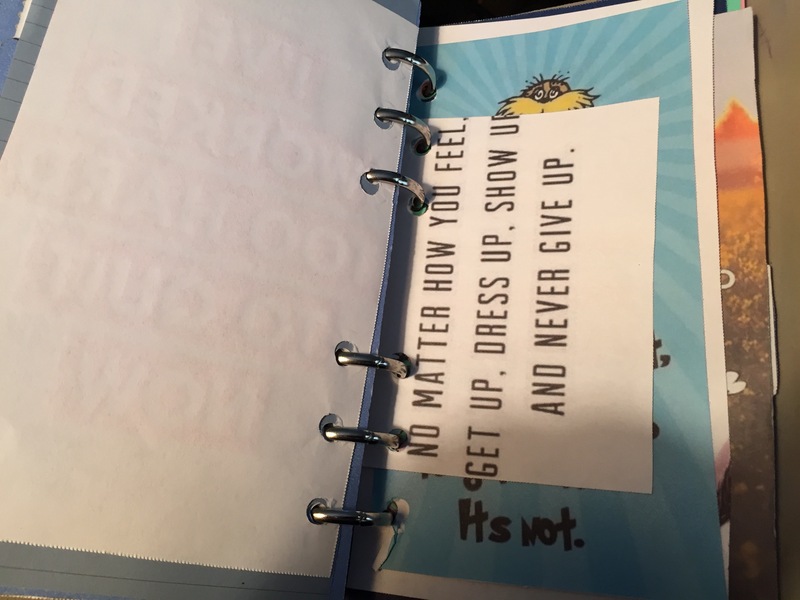 I also keep here a positive things sticky note, which I’ll talk about later, and a goals sticky note, where I have my goals for the week. This might seem like a lot to do just to make a to-do list, but it cuts way down on my time later because I never have to worry about how I’m going to get something done: it’s already figured out. My goals are now incorporated into my to-dos, and calendar, and I keep the ones for the week on my dashboard at the front of the binder. So then after the bulk of the binder are the rest of the sections: contacts, which are hidden because Internet, quotes, which I have a few pictures of! Notes, which is mostly Starbucks stuff to remember, Projects, which is stuff I’m planning to make for Etsy, and for other people, and last but for sure not least my Recovery section. 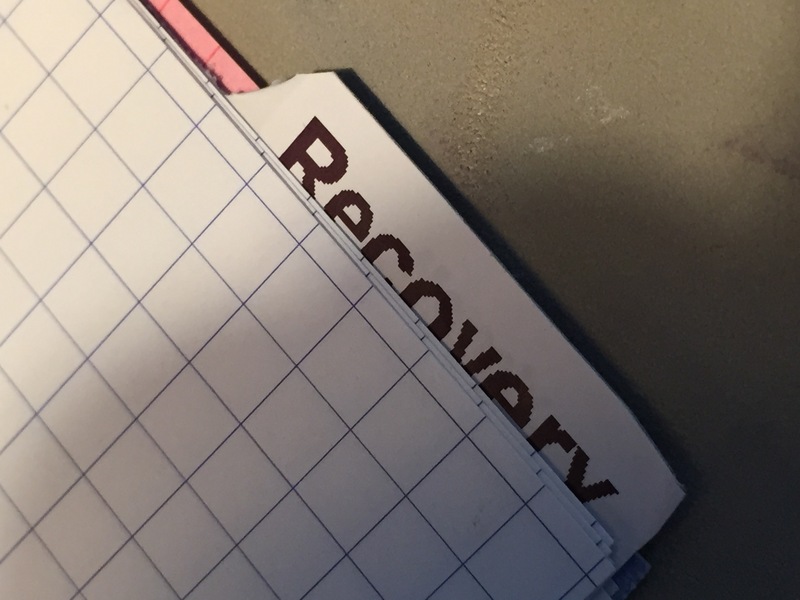 The quotes help if I need a boost, but the recovery section is super important and I will forever keep it in my carry-along binder. 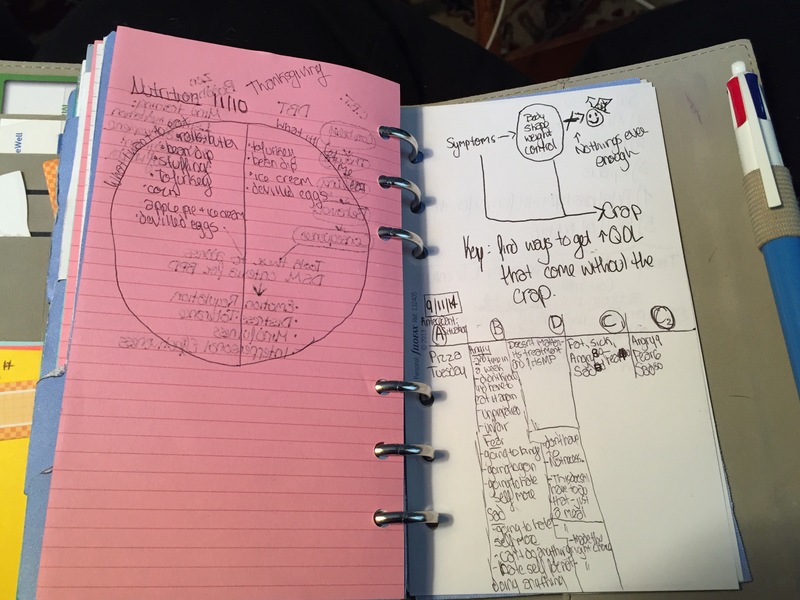 It has all of the notes from my treatment groups–CBT, DBT, Nutrition, the works. This way if I ever find myself really stuck I can look and see what I can do in that situation. 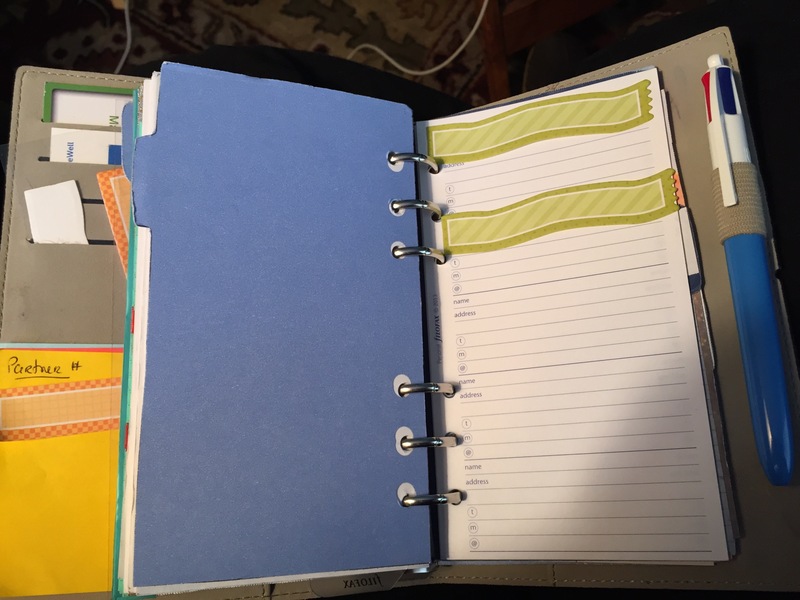 This is also where I make the lists I talked about in my last post, of things to do, and where I keep a running CBT log, because I’m a dork and find that they work. Basically, in here is everything that I could possibly need when I’m out and around. 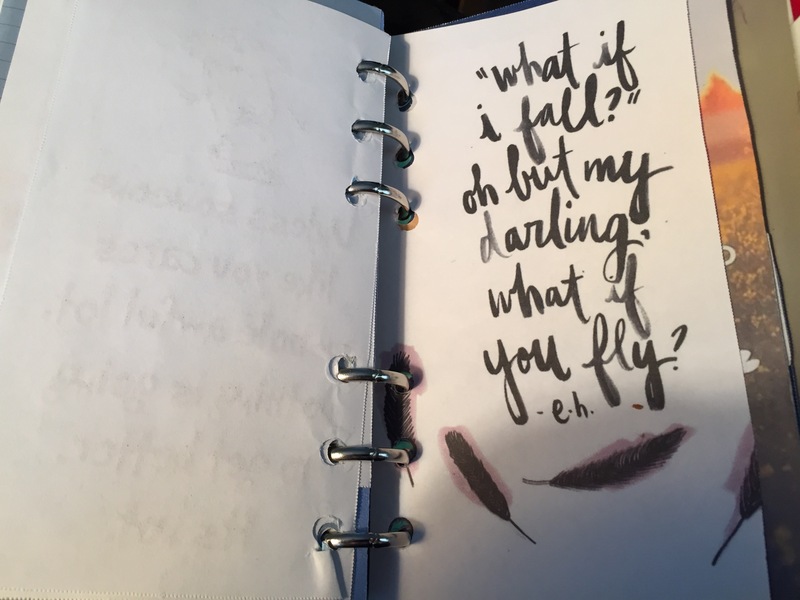 It keeps me on track, and helps me worry less, because it lets me both figure out how to handle a situation that’s come up, and plan to handle ones that may come up in the future. 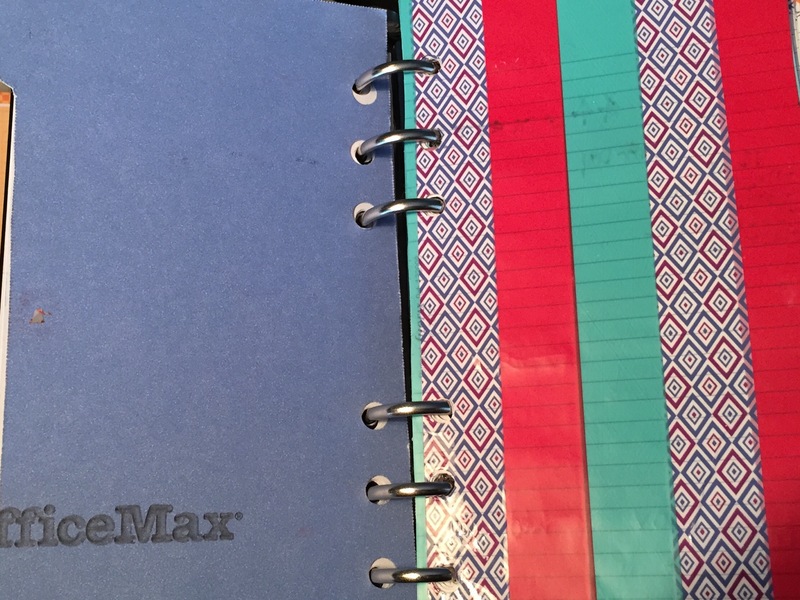 If anyone wants a post about setting up their own Filofax let me know–I’m planning on doing one around Christmas but definitely can sooner! Until next time, with lots of love.